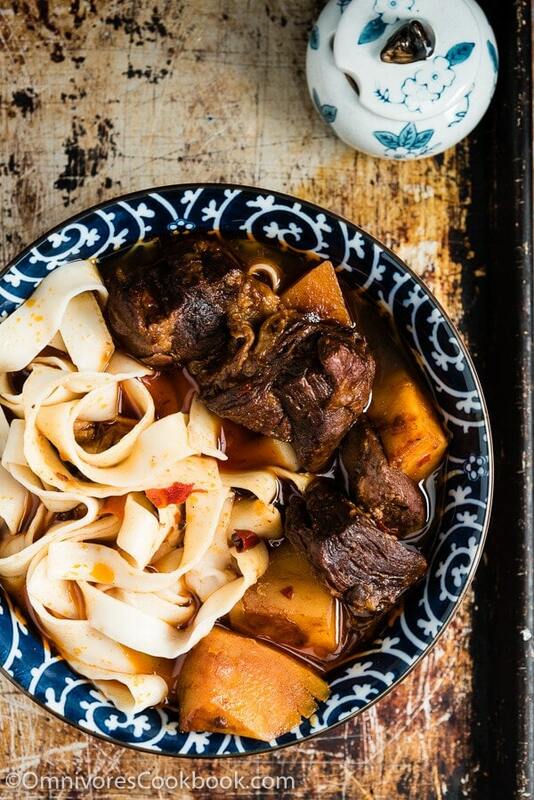 A bowl of hot noodle soup topped with tender braised beef is an absolutely satisfying comfort dish. 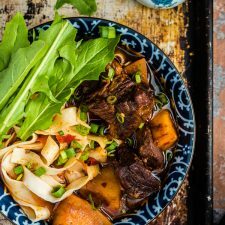 This recipe shows you how to create a bowl of beef noodle soup that is truly rich in flavor with the fewest steps. There are various types of beef noodle soup in China, but the best known internationally is the Taiwanese variety. I’ve never been to Taiwan, so I don’t know the true flavor of it. 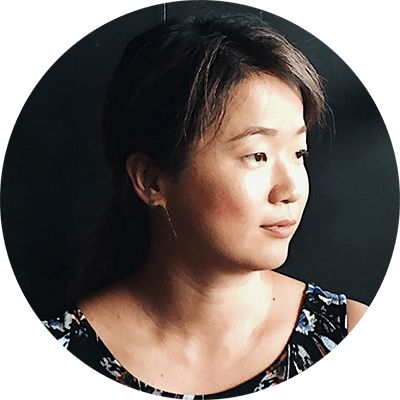 By reading the famous Taiwan beef noodle soup recipe from Lady and Pups, however, I can imagine how rich the noodle soup must be. 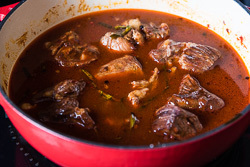 It uses a very rich chicken- and pork-based stock to make the soup, and various herbs and sauces to braise the beef. Compared to the Taiwanese version of the noodle soup, the one I’ve eaten on the Mainland is a bit different. We use a less intense beef stock (instead of chicken and pork stock) as the base of the noodle soup. 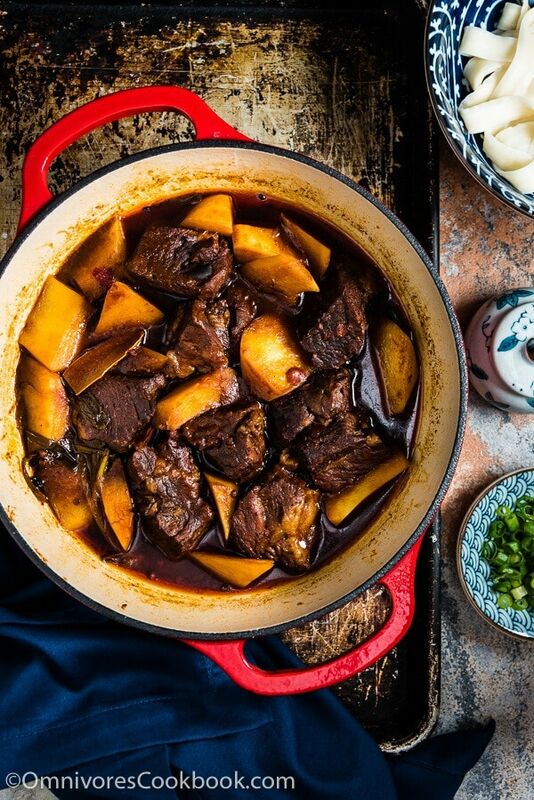 The beef is braised in a similar way, but the flavor is more similar to typical northern Chinese – spicy and savory without a taste of the sea. The dish usually uses fresh hand-pulled noodles that are wide and have a springy texture. The broth is less intense, and emphasizes the fresh flavor of the beef stock and the noodles. 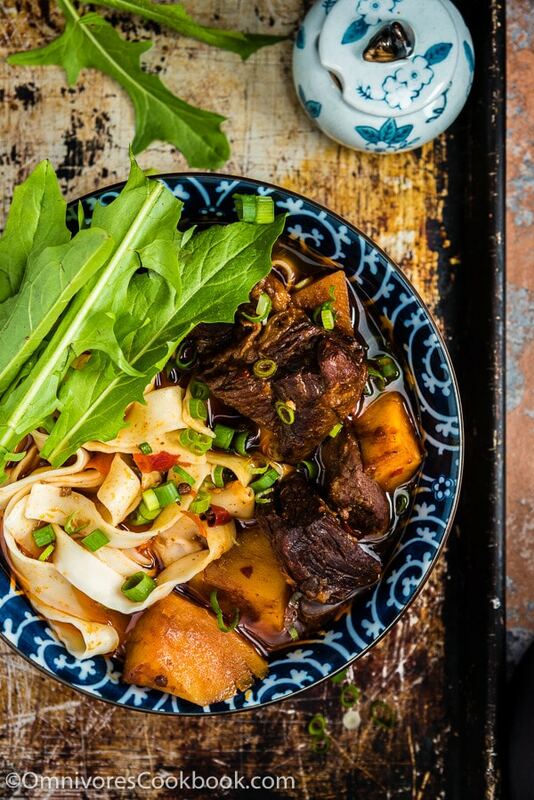 Making a delicious bowl of beef noodle soup is not easy. It requires 4 to 6 hours if you make the beef stock from scratch. I recommend you do so if you’re pursuing the best flavor. Actually, I wrote about a basic beef stock recipe, by which you can brown the beef with the soup bones to save time. If you don’t want to spend time making stock, you can use store-bought beef stock instead. In this case, you will need 3 hours or so to cook the beef (with only about 30 minutes of active cooking time). Selecting the right cut of beef is very important. Restaurants in China usually use cuts of brisket, plate, and flank (the parts that make up the belly of the cow) mixed with beef tendon. 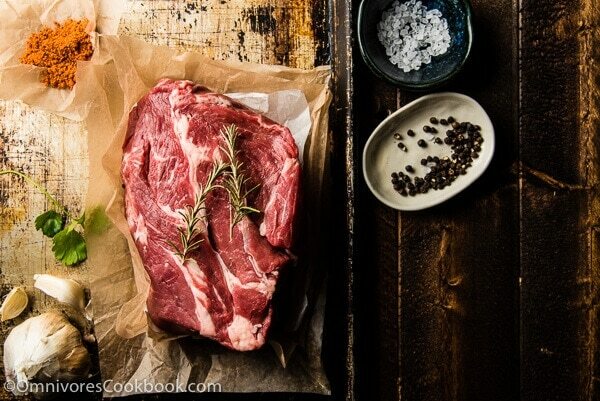 You need some fat content so the beef will be tender and juicy once it’s cooked. Before moving to the US, I never recommended using a leaner cut to make beef stew, based on previous experience in China. The average quality of beef in China is not great, in terms of both texture and flavor. The lean cuts are usually very bland and tough. Even you cook them for hours, the beef won’t get very tender. They will fall apart eventually, if you cook them long enough, but then the tough shreds of beef will stick between your teeth like strands of yarn. That’s the reason my mom always chose a cut close to the belly, never had the fat trimmed, and threw in a lot of beef tendon (already pre-cooked in a pressure cooker) to create a stew with a nice texture. When developing this beef noodle soup recipe, I was working on another project with 5280 Meat. The owners Ty and Rachel run the company in Colorado. They provide high quality, affordable, and clean meat products that are free of hormones, steroids, and antibiotics. Instead of using a familiar cut, I ventured to use a piece of 5280 beef grass fed chuck roast. You can see from the picture that the meat has a good amount of marbling, but overall is not especially fatty. I was a bit worried while cooking the dish, afraid the beef would turn out tough. The outcome was a big surprise. The braised beef still held its shape at the end of cooking with a great texture. Every single bite of the beef was so pleasantly tender and flavorful, without being greasy at all. By the way, if you value knowing where your food comes from, or care about the quality of the meat, definitely check out 5280 meat products on Overstock. They also sell big quantities (from a quarter cow to a whole lamb) on their own website. I’d definitely try out the half lamb for my next party. It would be so cool! OK, that’s all the talking for today! Let’s cook! If you aren’t cooking the Asian beef stock as well, start by browning the beef. You can achieve this either in the oven or on the stove top. 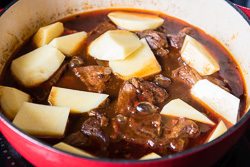 If you have already cooked my Asian beef stock recipe, skip ahead to step 5. To brown the beef in the oven, preheat oven to 400 degrees F (200 C). Cut beef into 1.5 to 2 inch chunks (about 4 to 5 cm). Spread the beef in a roasting pan. Spray a thin layer of oil onto the meat. Roast for 20 minutes. Take out the beef and flip. Cook until the beef turns to an even golden brown color, about 20 minutes. 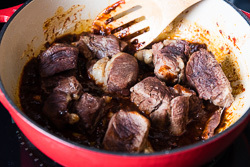 To brown the beef on stove top, heat a large heavy skillet with 2 tablespoons vegetable oil until hot. Add beef. Let cook without moving for a minute. Continue cooking until the bottom side turns golden. Flip to cook the other sides, until the beef is evenly browned. Transfer the cooked beef to a plate. Add 1/4 cup hot water to the baking tray (or the skillet). Scrape off the brown bits, so you can transfer them to the braising pot later. 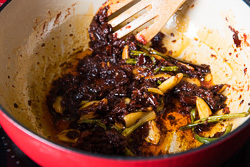 Heat a dutch oven (or a wok) with 2 tablespoons oil over medium heat until warm. Add green onion, garlic, ginger, and Sichuan peppercorn. Cook until the garlic turns a plate yellow color. Turn to medium low heat. Add doubanjiang and tomato paste. 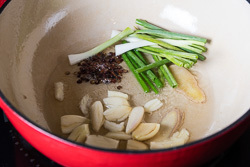 Stir and cook until the bean paste releases oil, 2 to 3 minutes. Add beef to the pot. Stir a few times to coat beef evenly with the sauce. Add back the brown bits from step 4, if any. Add 2 cups water, Japanese sake, soy sauce, brown sugar, curry powder, and cumin powder to the the pot. Stir to mix well. Turn to medium high heat. Cook until almost bringing to a simmer. Turn to low heat and cover. Let the beef cook at a very gentle boil until it starts to get tender, about 1 hour 20 minutes. Add veggies of your choice (potato, daikon radish, and/or carrot). Stir to mix well. Cover and cook until both the veggies and the beef turn tender, 20 to 30 minutes. 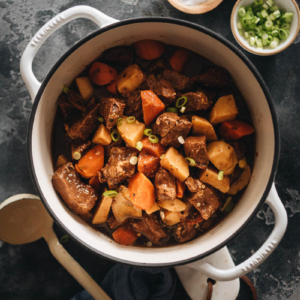 You can cook the beef stew one day before serving, store it in an air-tight container in the fridge, and reheat right before serving. When you’re ready to serve the noodles, bring a large pot of water to a boil and cook the noodles according to the instructions. In another pot, add about 6 cups beef stock (add less stock plus water to dilute, if you’re using homemade condensed beef stock. Cook until bringing to a boil. Divide beef stock among 4 bowls for serving. 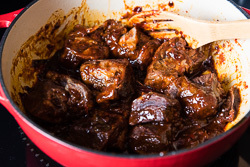 Add a few spoonfuls of sauce from the braised beef. Taste the broth. It should be a bit salty and very rich. Add salt if necessary. Mix well. Add noodles, top with a few chunks of beef and veggies, and garnish with green onions and greens (if using). Oh, Maggie! It’s cold and raining today and I sure could use a big bowl of this right now! Honestly, you always make the prettiest noodle soup bowls! Stunning! Maggie, this noodle soup looks so delicious! Makes me want to just dig right in!! I believe you can still create a very hearty vegan noodle soup. The first thing came to my mind is mushroom. 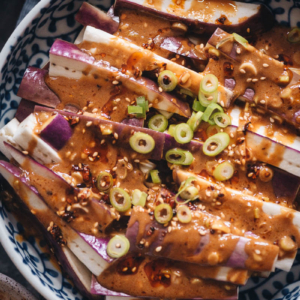 They add great umami to a dish and makes it super flavorful! I can eat this EVERYDAY. Taiwanese Beef Noodles are really good but not all are equal. I’ve never tried the Chinese versions. Malaysians have beef noodle soup too and it’s similar to pho type where it’s lighter but still super flavorful. I’d love to try out the Malaysian one! I tried their chicken noodles and they were so delicious. I like the idea of adding fish sauce into it. Super flavorful! This looks really wonderful! I have been trying to find some new soups for this winter and I have to put this one on my list! Hi, may I ask if i can substitute japanese sake with rice wine or shaoxing wine ? Thank you. 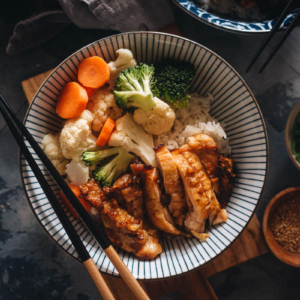 Yes, you can substitute the Japanese sake with rice wine or Shaoxing wine, both will work. This looks so good! I will try this out next week. Can the recipe be doubled? In the picture, it looks like it filled the whole cast iron, so I’m wondering if I’d have to make in two batches?